I picked this up today at a flea market. Not in the best shape but the cool factor is surely there. I have been trying to combine my two favorite hobbies for years. This poster does it all - Beer & Military in one item!!! Anyway, thoughts would be appreciated. Also I would really like some info about it. I cannot find another one on the internet. I have seen similar lithos but not with "Schmidts" on the sign. As a big fan of army stuff, home front stuff and beer, I say AWESOME! Very nice, I like the home front stuff like this. Less of it probably survived than the actual war stuff. I searched the Internet and could not find a poster like this. 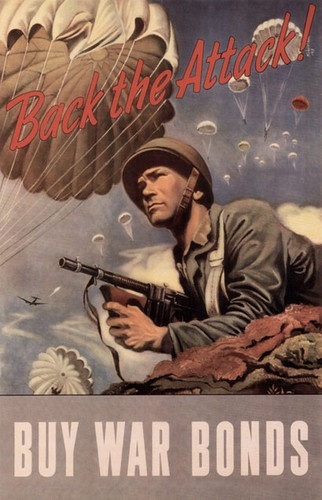 I found war bond posters with the same soldier but there were Airborne troops parachuting down in the background. Also those posters said "Buy War Bonds". I could not find one with a Schmidts logo on it. I am wondering if it is extra rare. Edited by anton67, 07 August 2017 - 03:23 PM. I am sure local company's such as Schmidt's were able to personalize their posts. A great regionalized war poster. +5 on the coolness factor. The colors are great. Thanks for posting! I would say it is "extra rare" ! Many companies made up their own posters for bonds, morale, safety, etc. Sadly the majority of them have been lost to time. Here in Milwaukee which was a big factory town there were a lot of production based ones. But only a few turn up. Yours looks like that almost 'chalky' paint style of printing, you just don't see anything like that in large numbers. Very cool. You hit the nail on the head with this: "Yours looks like that almost 'chalky' paint style of printing, you just don't see anything like that in large numbers." I am very happy to have found this poster so I can preserve it in my collection. Perfect for the WAR ROOM. I really love this poster so I decided to get it professionally framed with acid free mounting and UV protected glass. It also covers up some of the imperfections. Absolutely wonderful sir. Very well done!